As I walk down the sweltering city street of Washington D.C., I’m amazed at the number of gay-owned businesses! For a mile or two, it seems almost every business is wearing a rainbow flag. The flags greet me in each of the neighborhoods I visit during this two-day trip. After three or four neighborhoods, I realize that the meaning of the flags has shifted over the years. They may not all be gay-owned, but with these flags, these businesses are showing support for the LGBTQIA community. The shift makes me wonder if Gay Pride (the event) has morphed. Has it become just another party day, like St. Patrick’s, or Dio de los Muertos, or Mardis Gras? A day where any business with something to sell is going to fly that flag to get that money? In part, I think that might be the case. What do you think? Since then, things have changed. In the 20 years since I’ve graduated from high school, acceptance in the United States has come a long way. People have made this happen! Through protest, consumer choices, being visible, and voting, among other things. This acceptance comes on the backs of blood and tears and years and years of oppression, depression, suicide. It comes on the back of hope and a belief that one person can make a difference. Because when we are proud of who we are and brave enough to share this identity with people in our lives, they are forced to reevaluate their beliefs. They must ask themselves, how can this awesome person I love be part of this group that I fear and hate? And, when one person shares, they become a role model for another. Their action becomes another person’s strength. An important note, if you fear your family may react violently or murderously, please exercise caution and seek help and refuge. As Pride month wraps up, I just wanted to share these few thoughts and ask, What does Gay Pride mean to you? Photo Description; Many people stand on the street under blue skies with wispy clouds. 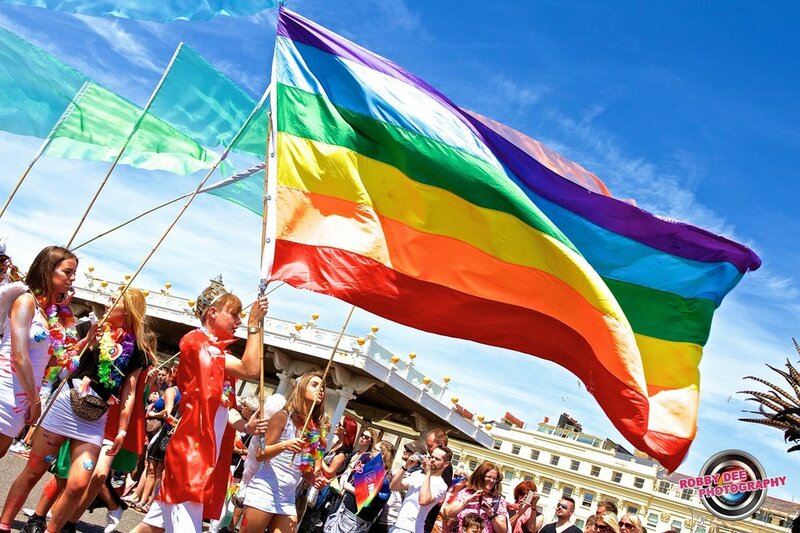 A person marches center left holding a large rainbow flag which fills almost half the picture, much larger than the person holding it. Some other people march behind with green triangle flags. The original gay pride flag flew in the San Francisco Gay Freedom Day Parade on June 25, 1978. You can read more about that, here. Thomas Ameloot is an Editor, Board Member, and Secretary for Life in My Days. He has had many adventures travelling around the U.S., writing and performing music, planting vegetables, tasting coffee, and working as a Food and Beverage QA and Training Consultant. One of his greatest joys in life is to bring joy to others, usually by making delicious local meals or sharing in laughter. You can follow his Instagram, Twitter, or Facebook, or check out his website.